Time: 2 hrs. 30 mins. The Groundhog Stock Trail is located in the San Juan National Forest on Lizard Head Pass near Telluride, Colorado. 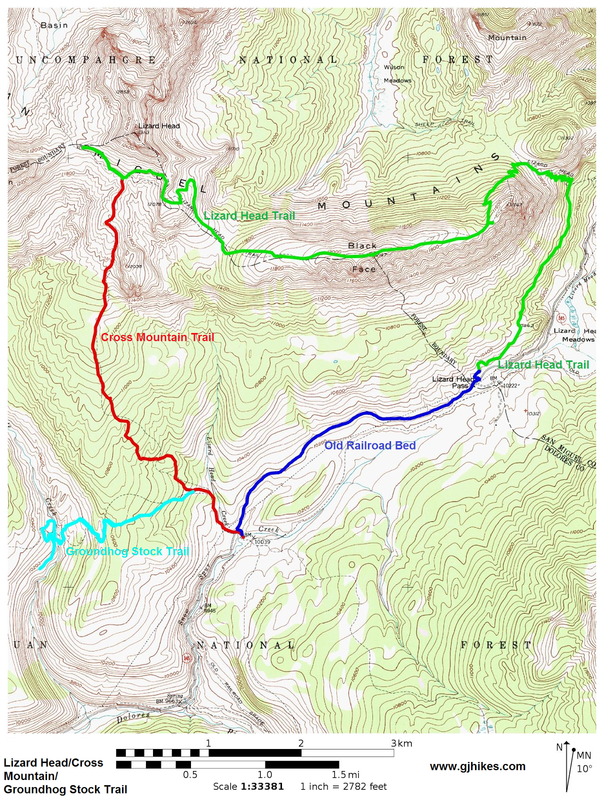 The entire trail is 13.4 miles long stretching from the Cross Mountain trail to the Groundhog Road FR #611. For this post we followed the first 2 miles of the trail beginning at its junction with the Cross Mountain trail and ending at a bridge over State Creek. The long stretch of the trail beginning on the east end at the Cross Mountain trail to Forest Road 535 is open to mountain biking. 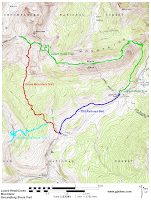 The trail then follows FR #535, also open to mountain biking, to the Kilpacker trailhead. 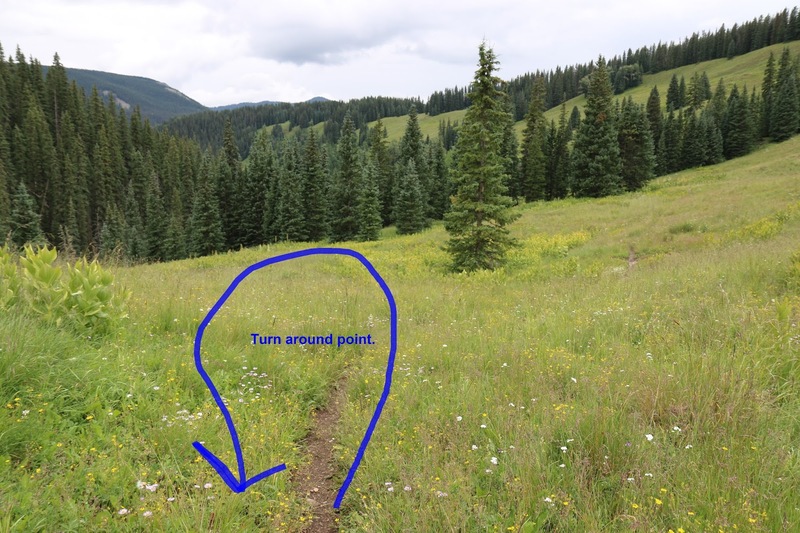 The next 1.6 mile section of the trail between the Kilpacker and Navajo Lake trails is open only to hiking and horseback riding as is the section between the Navajo Lake trail and Forest Road #611. To get to the Cross Mountain trailhead follow the directions for that trail. The Groundhog Stock trail begins at the 0.62 point of the Cross Mountain trail. That will add about 1.2 miles to the round trip distance for this hike which will make the total come out to 5.2 miles round trip. The trail starts out going through a cabbage patch with a slight uphill grade. Other than a few rocks and tree roots the trail is fairly smooth. Fresh bike tracks in the mud showed that mountain bikers were indeed riding the trail. At the 0.66 mile point measuring from the Cross Mountain trail the Groundhog Stock trail ceases its gradual climb and begins descending toward State Creek. 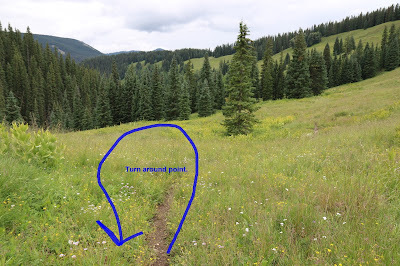 The trail gets a little confusing to follow in places because it is braided with numerous side trails. We were able to follow the course of the cut logs to stay on the main route. 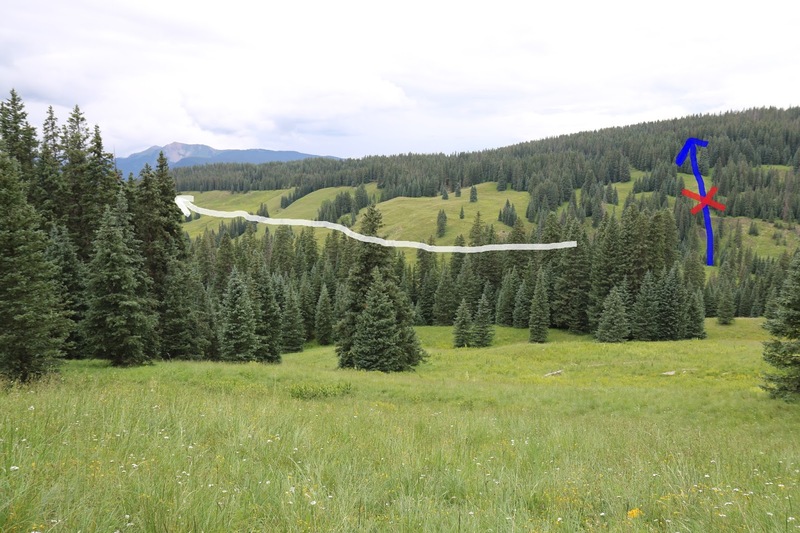 Just past the 1 mile point you can look out over the State Creek drainage at the grassy mountainsides and see a well defined trail angling off to the left on the west side of State Creek. Both of our maps and our GPS show the Groundhog trail going straight up the mountain after crossing the creek but that doesn't seem to be the case. As the trail comes out into the open there are some good views of the three 14ers El Diente, Mount Wilson and Wilson Peak. Just before reaching the creek the trail makes a steep descent down several switchbacks. A sturdy looking bridge conveys traffic across the creek. Since our maps and GPS showed the trail continues straight up the mountain we explored all over the hillside after crossing the creek but all we could find were some very steep game trails. We hiked up the hill and never did find anymore of the trail so we followed the trail that went to the left in the southwest direction that we had seen earlier. After following the trail to the left for over a quarter mile we turned around and headed back to the trailhead. Parts of the trail were overgrown with vegetation and we didn't see anymore of the mountain bike tracks that we had seen before. We will have to revisit the Groundhog Stock trail at some point and explore it further. For the next outing we will probably bring our mountain bikes and ride the trail all the way to FR #535.. While hiking the trail for this post there was an intermittent drizzly rain coming down. That wasn't keeping other hikers and mushroom hunters away though. For those that are in the area that don't think they can handle the steeper trails the Groundhog Stock trail would be another option. If you would like to see it for yourself then all you have to do is 'Take a hike'.